Minigolf is a great fun for everyone! It is a game, where moms can play with their sons and dads with their little girls. Grandparents can join grandkids and everyone can invite their friends for a great game of fun. Golf is usually played in groups of four, therefore it is suitable also for teams, who work together. Minigolf really suits everyone, as soon as you can and want to hold a golf club. Minigolf is a smaller brother to it’s bigger sibling: a sports of golf. But minigolf is much more fun! It focuses on one part of a golf, which is called putting. 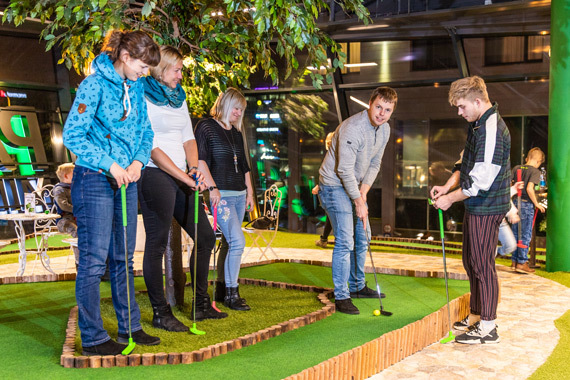 Minigolf is not to be mixed up with real golf, because it is played on artificial courses, whilst a sports of golf in played on courses with are situated on natural grounds. So minigolf is pure entertainment! Minigolf, which is played on artificial carpets, got started in the beginning of last century in Great Britain, but it got popular among audiences in United States. European first course of minigolf, ment for wider audiences, was opened in 1926 in Germany. But it got really popular, when Swedes Edwin Norrmann and Eskil Norman started introducing the game, having learned about it on their trip to America. Minigolf is easy but fun game, which doesn’t need any special skills and everyone can play it. It is nice to come with family or friends for a round of minigolf to spend some time together. If you come for a game for the first time, notify our administrators and they will teach you some quick tips. If you come as a bigger crowd, divide yourselves to groups of four. Hole must be started in the labelled area and each following stroke must be done where the ball stopped. The purpose of the game is to get to the hole with least possible strokes. If a stoke ends out of bounds, fresh start must be done from the beginning, counting also previous strokes. If on a Park course ball doesn’t end up in a hole with 7 strokes, 8 will be written on the score-card and new hole must be played. If in Wild Wild West Saloon ball doesn’t end up in a hole with 12 strokes, 13 will be written on the score-card and new hole must be played. If a ball stops directly and the edge of the course in a way that next stroke is impossible to make, then the ball can be moved about 10 cm (golf club width) away from the edge. Administrator will give out score-cards for the game and stoke counts can be written down there. Administrators will give out clubs and balls for the game, please use only them on the courses. If there is a company behind you, who plays faster, let them pass you so that everyone can enjoy themselves. In case of any questions, please talk to our administrators.